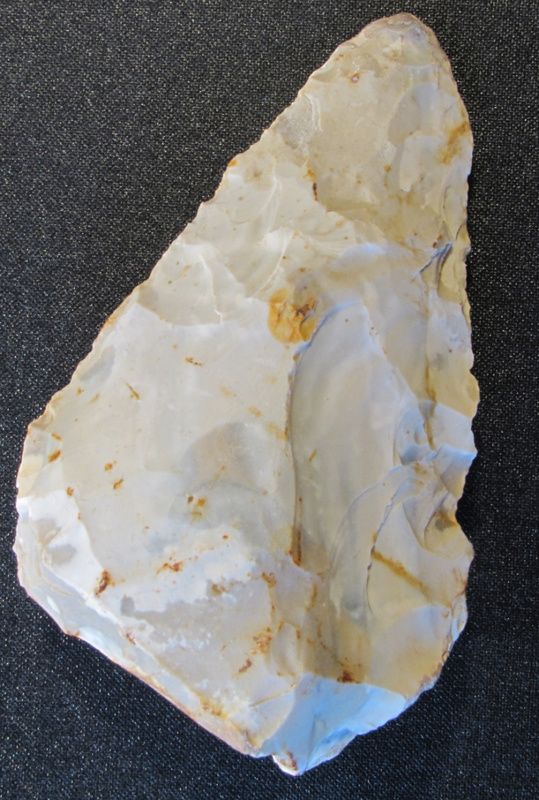 This is a very flat typical MTA handaxe from the Loiret (9,0x4,5x0,4 mm) found near Orleans in the Loiret (central France). It is a good example of the MTA method of shaping bifaces, described by Soressi. Such handaxes were produced by the shaping with a soft hammer of a bi-convex transversal section, which may become plan-convex during repeated renovation. This principle is known both from the MTA of N- France and S/W France ensembles. There is no indication for an earlier date for these two artifacts, which is important, as cordiform Bifaces occasionally were found in older context. The removals that create the artifacts are generally struck from the lateral sides of the rough out. In most of the cases, the retouch is not absolutely symmetric and often one edge is longer than the other as shown on another Handaxe (Châteauneuf-sur-Loire, Figure 2). An essentially non dated Acheulian in the Loiret around Orleans is well developed and has many affinities to the Acheulian of the Indre and Loire region. 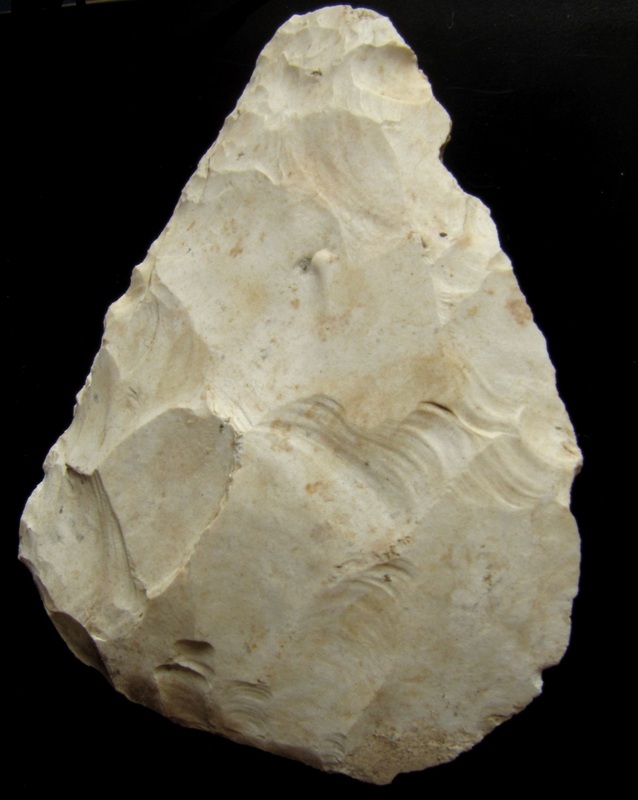 Acheulian handaxes were found in abundance on the plateau of Briare and Gien and in the sandpits of Châteauneuf-sur-Loire and Saint-Denis-de-Hotel. The two most beautiful bifaces I personally know were already found during the 19th century at Châteauneuf-sur-Loire and Chécy and measure 25 cm and 19 cm respectively. Other surface finds are known from the municipalities of Nevoy, Ouzouer-sur-Loire, Bray-en-Val, Saint-Aignan-des-Fords, Saint-Martin-d'Abbat and Germigny-des-Prés Mardie. For sure, well stratified Archaeological sequences, known from other very old sites elswhere in the Loire valley, are still awaiting excavation. A rich Mousterian deposit was discovered in 1922 by A. Chevillon at the Garenne site near Triguères. Unfortunately we lack of any new publication about the material, which has never adequately described. Its attribution to an MTA is more than dubious. Anyhow, surface finds with cordiform, subtriangular and triangular bifaces, as shown in this post, can be typologically assigned to the MTA of France and may date to a timeframe between OIS5 and OIS3.